Ipagbunyi natin ang ating Pambansang Bayani!! At ipagdiwang ang mas murang Pamasahe!! As low as P475++/575++/675++/875++ for travel dates January 15 to March 22, 2018. Limited slots available, first-come, first-serve basis. Fares include meals, 75 Kilos Free personal baggage allowance. Tickets are nonrefundable but rebookable. Of course subject to applicable fees and fare difference. How much is the fare of cebu to manila? 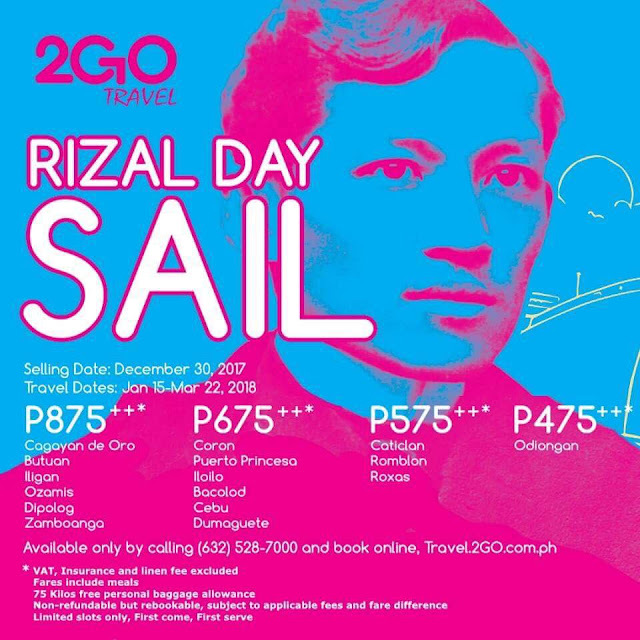 how to get promo ticket manila to cdo.? Manila to dipolog,I need low price.. hope give me,a update.godbless. Meron nba schedule January 13 2019 manila to dumaguete..
Mg kanu po manila to mindanao..
May promo po ba sa jan.09 2019?kong meron mag kano po ba from manila to iloilo? How much maam , from manila to davao? Howh much po bacolod to cagayan de oro this jan. ? How much the ticket manila to ozamis on march 25?? How much po manila to bacolod on march 25?